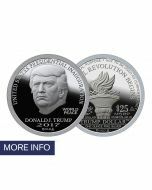 Silver Trump Dollar in Brilliant Uncirculated (BU) Mint condition with one ounce of .999 fine silver and a satin-like finish. 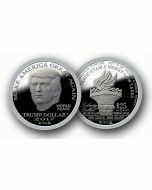 The obverse of the Silver Trump Dollar features an original sculpture of Donald J. Trump and the motto: TRUMP THE GOVERNMENT that urges the presidential candidate to reform the government from its current political mess. 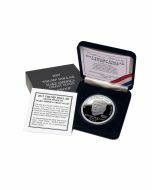 The obverse also features WORLD PEACE in hope that the President actively works toward world peace via a sound money initiative. 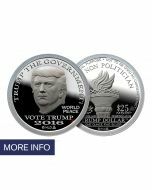 The reverse features the Liberty Torch and urges voters to VOTE NON POLITICIAN with a MSRP of $25. Silver Trump Dollar contains one ounce of .999 fine silver that was minted in Brilliant Uncirculated (BU) mint condition with an original satin-like finish. 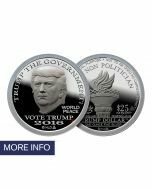 Both 2016 Silver Trump Dollars contains one ounce of .999 fine silver. 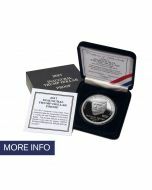 Due to the very limited mintage of the Type I Silver Trump Dollar, it is now only available from the after-market for $32.50. This sought after First Issue collectable will continue to appreciate due to the very limited number of Type I Trump Dollars that were minted.